Proud to present this DX7 panel as a result of successful co-operation with forum member pascalc, who has done the Lua programming! 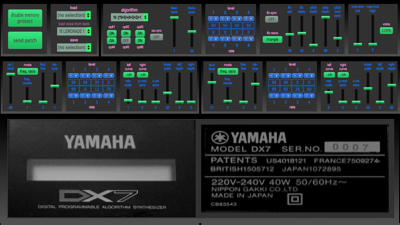 This panel is mainly based on the TX7 panel, but due to some differences between the two devices a special DX7 panel was created. Some notes on this panel. if you like this panel so much you wonder how to express your gratitude, please donate to CTRLR.org so Roman Kubiak (aka atom) can finally buy a proper Macintosh computer ;-)! I’ll have a look at it and will get back to you. I just tested the panel with my DX7 and both the issues you mentioned work fine on my setup. Can you describe a bit more detailed and send what sysex that is being sent? If you still have issues with this panel you might have a try with the TX7 panel. We noticed during the development of these panels that the MIDI implementation of the two devices differ quite a bit. The only advise I can give you is just try it. We never tested the software with this board. looks really good. will it work with VolcaFM?? I’m pretty sure it won’t. The Volca FM is from Korg AFAIK and it will only work if they use EXACTLY the same MIDI specs. Sorry! I plan to try this with my DX7 but it has a Grey Matter E! Board and I would like to extend the MIDI implementation to support this. Anyone had any experience or success with this combination? Does it matter if its a Yamaha DX7 FD II? Will this panel still work? Considering buying this synth and curious as to wether the bi-timbral and layering additions effect how this panel will function.